Yesterday we talked about learning to ‘follow the arc’ to the star Arcturus in the constellation Bootes. You just follow the curve in the Big Dipper’s handle until you see this orange star. Tonight, let the Big Dipper introduce you to another bright star. This star is Spica in the constellation Virgo the Maiden. 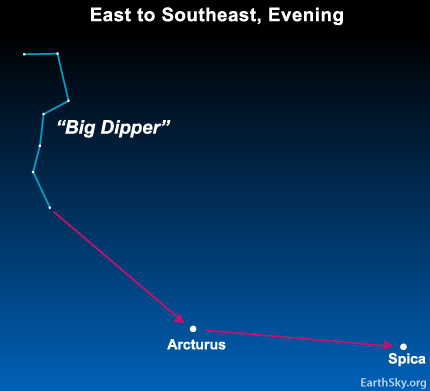 You can ‘follow the arc’ to Arcturus AND ‘drive a spike’ or ’speed on’ to Spica. Spica in the constellation Virgo looks like one star, but this single point of light is really a multiple star system – with at least three member stars – located an estimated distance of 262 light-years away. Spica’s constellation, Virgo, is large and rambling and difficult to see. However, you can look for a little squarish figure to the right of Spica. This is the constellation Corvus the Crow, which we show on our May 10 sky chart.